I love crêpes. They are super versatile, kid-friendly, and easy to make. We were introduced to crêpes by a lovely French exchange student named Hélène who stayed with my family for a summer when I was a child. Hélène and I recently reconnected after MANY years, and as it turns out she is a nutritionist! For years my family would make these on the weekends and fill them with different fruits. These can also be made with savory fillings like ham, cheese and vegetables. Spinach and cheese would also be “délicieux”! The major substitution in this recipe involves the flour. Instead of using all -purpose flour, I use white whole wheat flour. The white whole wheat flour is very light in texture, flavor and looks very pale, making it very easy to add into crêpe batter. One of the ways that we get some veggies into our breakfast is to make savory crêpes with tons of greens, mushrooms and some cream cheese sautéed until wilted and delicious. We roll this mixture into our crêpes for a nutrition packed breakfast that gets a serving or more of veggies into our day! Make two batches on the weekend to make weekday breakfasts a snap! This can even be a super quick dinner with your favorite savory fillings. Whisk together eggs and milk until combined. Add in flour, melted butter, sugar and salt and whisk until it is the consistency of heavy cream (you may have to add a little extra milk). Coat a skillet lightly with cooking spray, and place over medium heat. Put about 1/4 cup of batter in the middle of the skillet and tilt the skillet in a circular motion so that the batter spread over a large area. Cook 1-2 minutes until lightly brown. Flip, place filling in middle, and cook another 1 minute. Remove from the pan and fold into quarters. 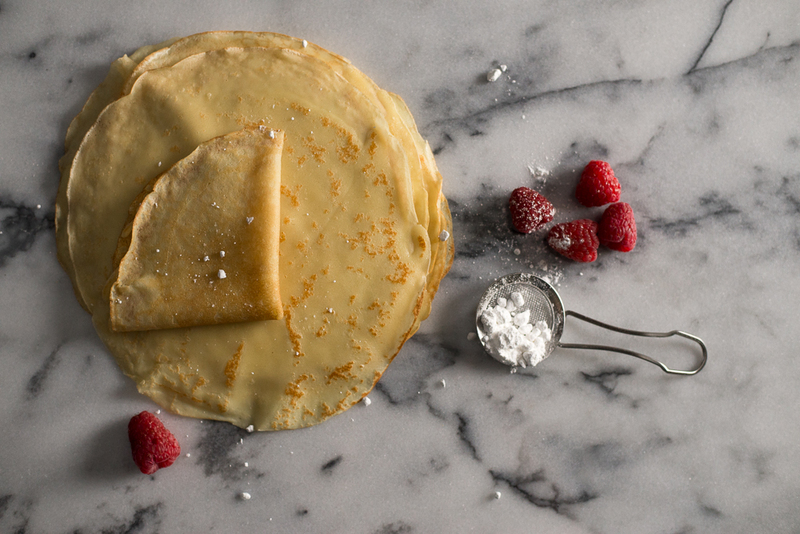 For crêpes with sweet fillings, dust very lightly with confectioner’s sugar.